Stacy: I keep track of all wires and automated clearing houses (ACHs) that we send out daily, deposit all checks that come into the home office, general ledger (GL) code bank statements, and bank reconciliation on several accounts. I also do the daily dashboard and asset-based lending (ABL) sheet and help out with basic general administrative things whenever needed. Stacy: I was born and raised on Long Island, New York. Stacy: I went to a local school on Long Island called Briarcliffe College. I received my associate’s degree in computer information systems in 2002. Then I went back to Briarcliffe College and received my bachelor’s degree in business administration in 2011. I would love to go back again for a degree in accounting. Stacy: I knew early on that I liked working with numbers and computers. My first office job was working for Verizon in their business call center. Verizon paid for my associate’s degree in computer information systems, but I didn’t like programming — I found it to be very complicated, competitive and kind of boring. I ended up working as a dedicated billing specialist for Verizon. I worked on complicated and long-standing billing issues and I loved it. I have worked in the accounting and billing field ever since. Stacy: I wanted to write novels and poetry. Stacy: Three years. I started June of 2012. Stacy: I would have to say going to Miami, Florida for a conference. It was a first for me. First time in Miami and the first time I was on a plane. It was a work trip but I truly enjoyed myself. Stacy: I’m a mother so I spend a lot of time with my children and family, but I do enjoy writing short stories, poetry and read a lot. 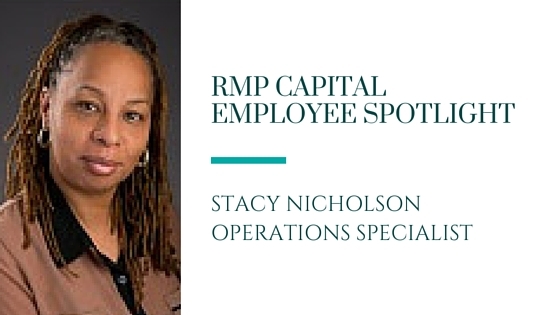 Stacy, we’re so grateful for your contributions to RMP Capital. Thanks for allowing us to get to know you a little better!